Help some archaeologists on an excavation. Ask Galan Brandt for orders. Swim to The Northern Wind from Bal Oyra. Talk to Salious Mangrondius about Manzirache. Head into the ruin. From the Entry, go to the Factory Maintenance Tunnel, to the Hall of Dumac. Kill every centurion in sight until you get a journal update. Return to Salious and tell him the ruin is safe. See Galan Brandt for your reward. For your third Fighters Guild assignment from Firewatch you have been tasked with aiding an expedition team through a Dwemer ruin. Make your way to Bal Oyra and swim east-southeast from the docks. Eventually you should run into a ship called The Northern Wind. This ship is headquarters for the expedition team. Finm Amas can be found on the main deck and he will direct you to Salious Mangrondius for a briefing on the team's current situation. 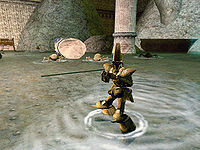 It seems that they have found a section of the ruin called the "Hall of Dumac", and the place is filled with live centurions trying to escape the flood. It is your job to get rid of these centurions so that the team can continue their research. You are given a few potions and scrolls of water-breathing and swift-swim (you're going to need them soon), and sent off. As you might have already guessed, the ruin is completely underwater. The entrance itself is beneath the group of arch formations beside the main ship. The entry room is a vertical corridor with two leveled creatures. At the bottom is a door that leads to Nuzunch Hall - not the direction you need to go, but an interesting side-path for the curious. Going back to the entry, there is a dark hole leading to the "Factory Maintenance Tunnel". This place is simply a flooded tunnel, devoid of enemies, which takes you to the Hall of Dumac. Here you encounter several spider centurions as well as a couple of scout centurions. Kill them all and you should receive a journal entry saying you have "disabled" all of the constructs. Back on the ship Salious thanks you for your help and sends a special something(s) to Brandt. Report back to Brandt to receive this reward - Left and Right Dwemer pauldrons - along with two Fighters Guild reputation points. 10 Galan Brandt has asked me to talk to a band of archaeologists at the dwemer ruin of Manrizache and help them with their expedition. The archaeologists are onboard a ship known as the Northern Wind. To get to their mooring I should swim southeast from the Bal Oyra docks. 20 Salious Mangrondius wants me to clear out the dwemer constructs from the Hall of Dumac, where they have been trapped due to the flooding. 30 I have disabled all of the dwemer constructs in the Hall of Dumac. 40 I told Salious Mangrondius that it was safe to resume exploring the ruins. 100 Finishes quest Galan Brandt congratulated me on a job well done in Manrizache.